Hi Everyone – my name is Frankie and I’m eight months old. I recently had a bad fall out of a 4th story patio and my previous owners couldn’t afford my vet bills, so I ended up at the Pug Rescue. I am very lucky to be alive, but the doctors weren’t able to save my left eye. 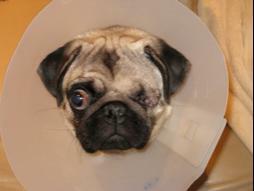 As luck would have it, I fell into the arms of a loving family with two other pugs the very same day as my surgery. They love me very much and give me lots of hugs and kisses. My mommy said I am the fastest eater she has ever seen, and growing stronger and more confident every day. Having one eye is not slowing me down at all! I’m having the stitches removed next week and can’t wait to get this cone off my head, so I can run around and play with my new brother and sister. Gotta run, going outside for a walk with my new family!